Anyone who knows me knows that pickles are one of my favorite foods. I’m obsessed with pickles, so I’m always looking for new and fun ways to incorporate them into my meals. 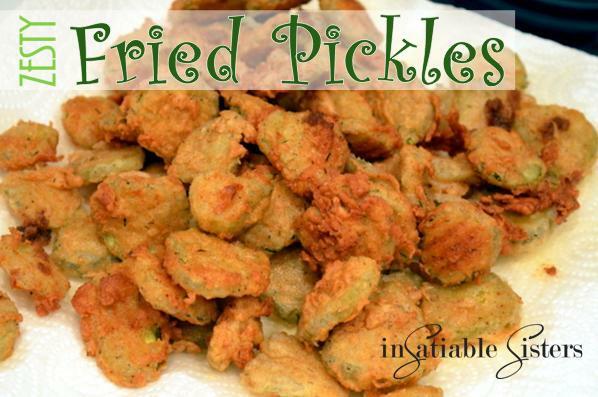 These fried pickles are addictive and are a fun finger food! Who needs utensils, right? Everytime I make them they are gone in a matter of minutes! These go perfectly with my hot wings on game day, GO SEAHAWKS!!!! Or my pretzels and beer cheese! Fried pickles and beer cheese? I think I’m on to something!! 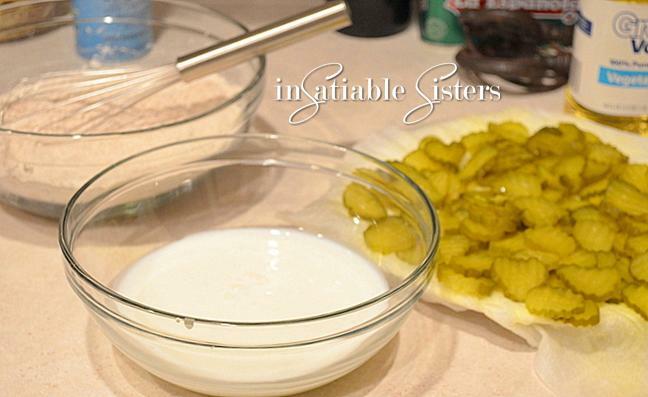 About 3 cups of dill pickle chips, drain on paper towels. Combine all dry ingredients into a bowl, put buttermilk into separate bowl. Make sure your pickles are well drained. Heat oil in a 4 to 6 quart heavy bottomed pot to about 350 degrees F. Dunk ½ a cup or so of pickles into the buttermilk, coating all sides. 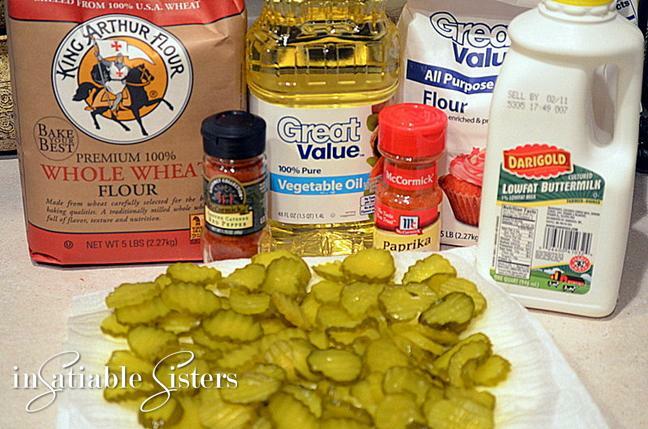 Shake off excess buttermilk and put into the flour mixture, toss the pickles around so they are all coated. 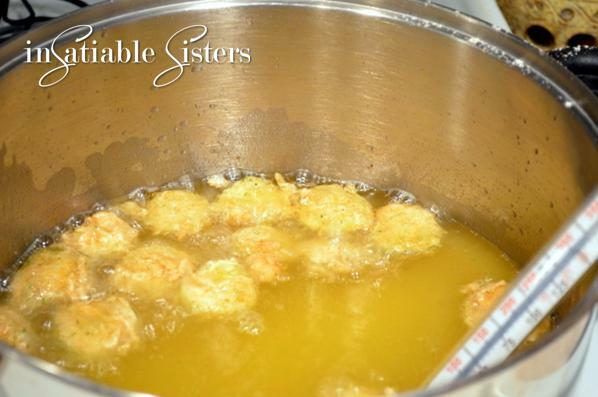 Fry in the hot oil until golden (2-3 minutes) and let them drain on paper towels for a few minutes. Repeat with the remainder of the pickles. Enjoy as they are or for an added kick of flavor dip them in ranch or bleu cheese dressing spiked with hot sauce!! These go fabulous with a cold beer! Taco salad is a staple in my household. We probably have it 3-4 times a month. I cook and season the meat and make a bean salad, then it’s a free-for-all where we each get to build our own salad. The only problem is we ALWAYS have leftover meat and beans and, even though we love it, we get kind of bored after the 2nd day of taco salad leftovers. That in mind, I decided to work on a dish that would use all those leftovers and turn it into something new. SUCCESS! Those same savory southwestern spices carry over beautifully into this dish, but in the form of a hot, gooey, delicious enchilada. And the best part is, they are so easy, even if you don’t have a bunch of leftovers to use up. Prep takes about 20 minutes and baking is minimal since the filling is already hot. We still love Taco Salad, but now we also look forward to “leftover” enchiladas. This full recipe makes a about 18 enchiladas. *If you want to make this a vegetarian dish, simply replace the meat with an additional can of beans or about 1 1/2 cups cooked quinoa. **You can also use grilled sweet corn when it’s in season, which is what I prefer. The grill adds so much flavor! If using ground beef or turkey, brown meat in a skillet. Add taco season and 1/4 cup water to meat and allow to simmer about 5 minutes. To the skillet add beans, corn, tomatoes, 2 of the onions, cilantro, lime juice and spices. Reduce heat to medium low and allow the mixture to heat through. In a separate small frying pan, heat oil on medium-high heat. Once it’s hot, fry the tortillas one-by-one, about 10 seconds on each side. Drain on paper towels and allow tortillas to cool enough to handle. Coat the bottom of a 9×13 pan (or 2 8×8′s as I did) with a few tablespoons of enchilada sauce. Spoon about ¼ cup of filling mixture into each tortilla plus a pinch of cheese. Fold over filling and place enchiladas seam-side-down in the pan. Top with remaining enchilada sauce. Cover with remaining cheese and green onion. Bake for about 20 minutes or until cheese is melted and starts to brown. Pile on sour cream, diced avocado, shredded lettuce, black olives, jalapeno’s or whatever toppings your prefer. Eat up! I love chili! Probably partly because I like spicy food and I put a lot of kick into my chili. 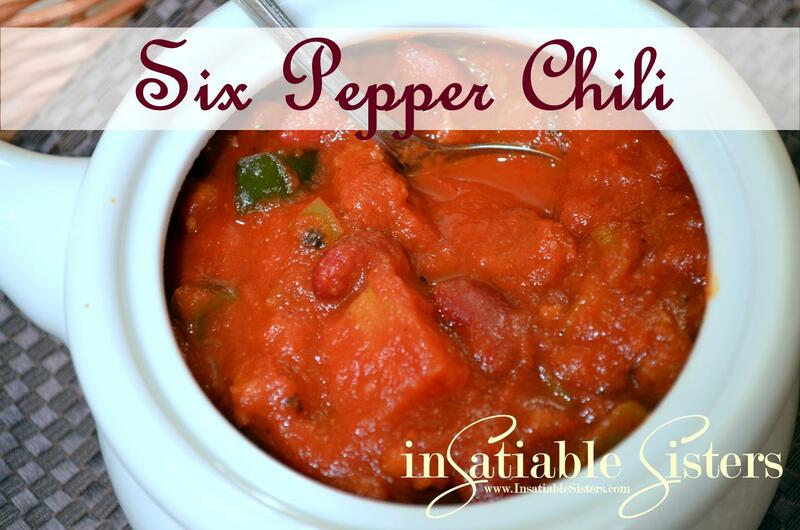 In our house, when Joanie and I were kids, chili was a staple and it was always homemade. Sometimes we would even make moose chili but that’s a whole other blog! Brown pork in a skillet on med/high heat. In large stock pot, sauté onions and all peppers. Once tender, (about 5-7 minutes) add the bottle of beer and stir a couple of minutes. Add the tomato paste, tomato sauce, diced tomatoes and beans, stir to combine and bring back to a simmer. Add the pork without draining (unless there is tons of grease) and all of the spices. Stir to combine and Simmer at least 1 hour. Salt to taste and enjoy on a cold winter evening! I have been baking banana bread as far back as I can remember. It was one of the first things I learned how to make by myself when I was a kid. I remember pulling the steaming loaves out of the oven and being so proud of my creation! They never lasted long, and to this day, banana bread is one of my favorite comfort foods. This recipe is not the same recipe I used growing up. It is a creation of America’s Test Kitchen and was introduced to me through a foodie friend at work who generously shared the banana bread she had made with the rest of the office. Although I wasn’t fast enough to snag a piece out of her bread from the break room, she did provide me with the recipe. After hearing the comments around the office, I knew I had to make it for myself. Seriously, this is the most banana-y banana bread I’ve ever had and it is so incredibly moist! Don’t scoff at the little bit of extra work with the bananas because THAT is what makes it so incredible. Just do it, you will be rewarded! When selecting bananas, be sure to use those that are heavily speckled, or even black. If you are one of those people who freezes bananas, this is YOUR recipe!! The darker the banana, the sweeter and more developed the banana taste will be. A lot of grocery stores will even sell these “overripe” bananas at a deeply discounted price. Yes, those mushy, black banana’s seem really gross, but trust me, you’ll be hoarding them in your freezer like they are gold once you’ve seen (and tasted) what they can do. **Note: The photo below shows baking powder, which is NOT in the recipe…my mistake! Spray an 8 ½ by 4 ½ inch loaf pan with nonstick cooking spray. Whisk flour, baking soda, and salt together in a large bowl. Place bananas in a microwave safe bowl. I used a round casserole dish with a lid. You can use plastic wrap with a few cut steam vents to cover if you don’t have a lid, but personally I avoid putting plastic in the microwave. Microwave on high power until bananas are soft and have released most of their liquid, about 5 minutes.Transfer bananas to a fine mesh strainer placed over a bowl and allow them to drain, turning the bananas occasionally for about 15 minutes. You should end up with ½ – ¾ cup of liquid. Transfer liquid to a small saucepan and cook over medium-high heat until reduced to about ¼ cup. 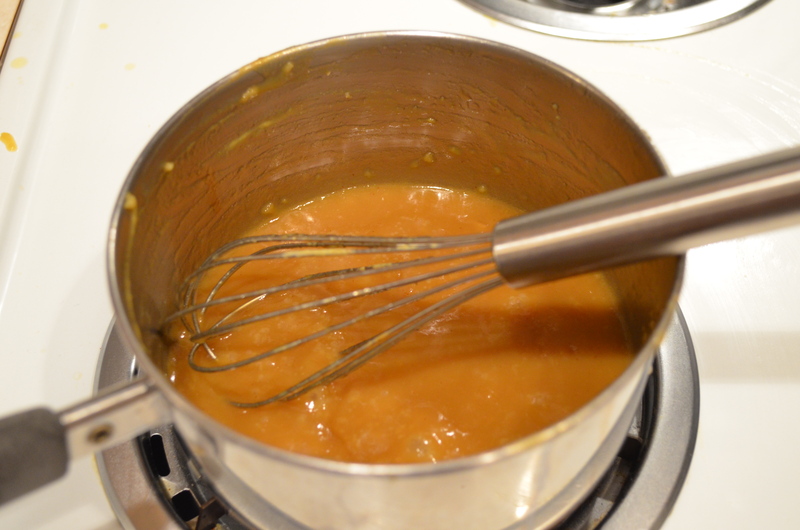 Liquid should be light caramel color and thick, almost as thick as syrup. I stirred mine pretty vigorously and ended up with some bubbles, but you get the idea. Remove from the heat and stir this reduced liquid back into your mashed bananas and mash everything together with a potato masher. The original recipe says “mash until fairly smooth” but mine never made it to that point…it stayed semi-lumpy. I’m sure whatever stage of lumpiness your bananas end up is just fine. Pour banana mixture into your flour mixture and stir until just combined. Do not over stir. Some flour streaks are okay. Gently fold in walnuts if you’re using them. Scrape batter into prepared pan and sprinkle granulated sugar evenly over the surface. Bake until a toothpick inserted into the center of the loaf comes out clean, approx 55-75 minutes. Cool bread in the pan on a wire rack for about 15 minutes, then remove loaf from pan and continue to cool on a wire rack. **Note: I used a mini loaf pan and a muffin pan instead of the larger, single loaf pan. I started checking them at 30 minutes. The muffins were slightly drier than the loaf and I would probably turn the oven down a few degrees the next time. ***Variation: I added ½ cup of flaked coconut to the muffins and they were SO good! Slice loaf and serve slightly warm or room temperature. Enjoy! 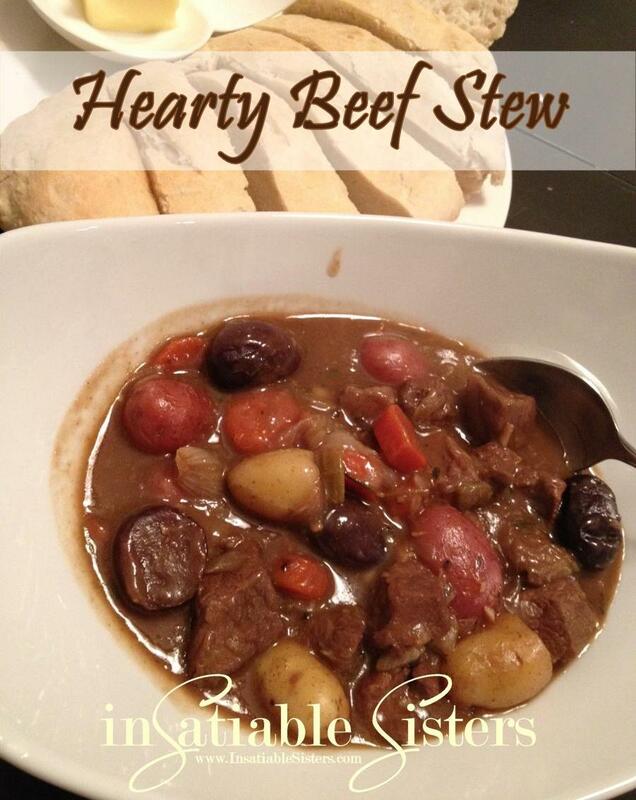 This beef stew is the best beef stew you will ever have! It’s loaded with delicious meat potatoes, veggies and fresh herbs. It’s slow simmered to get a thick, silky broth that is perfect for sopping up with a crusty piece of French bread with homemade butter. This is one of those times when I wish I still lived in a cabin in the woods in Alaska. 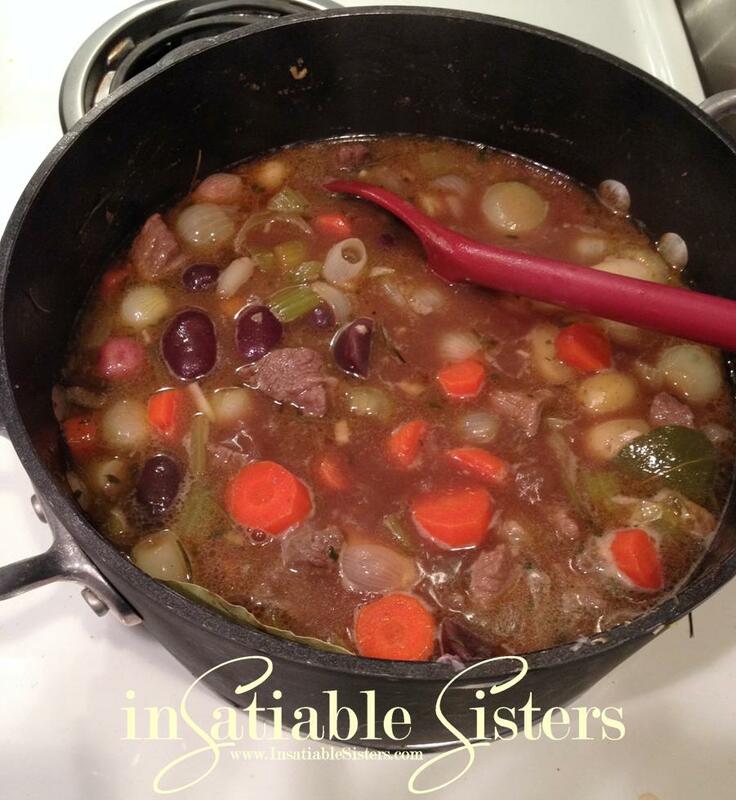 I’m sure fresh moose steak or caribou would be fabulous in this stew. I can just imagine the stew simmering away all day while I’m out shoveling snow or bringing in fire wood. I envision my husband’s soggy coat and gloves hanging by the wood stove to dry after a hard days work. The sun is going down, making way for a frosty evening, the perfect accompaniment to a bowl of hearty stew. Is your mouth watering yet? Mine is. 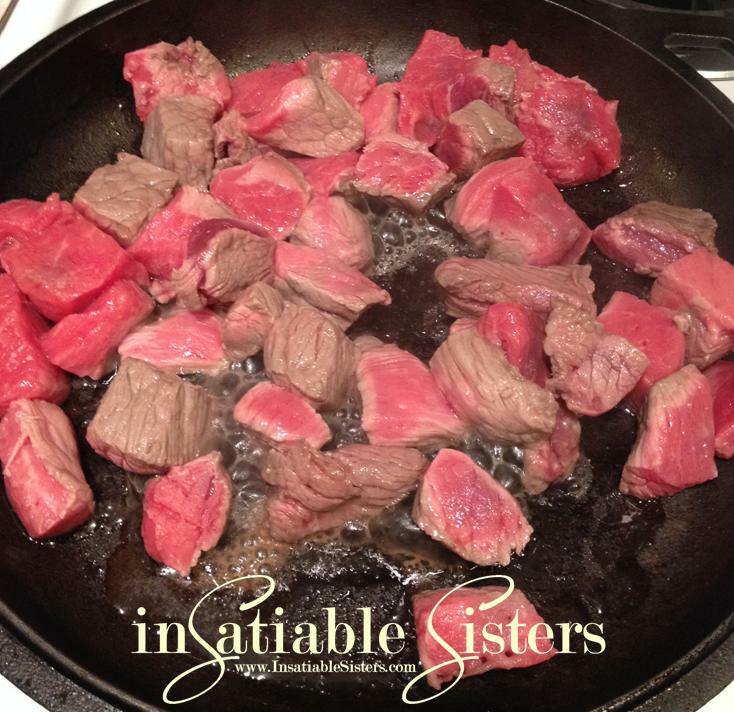 Brown beef in a skillet. In a large stew pot, melt butter on low heat, when melted add the flour a little at a time and whisk until you make a paste called a roux. Add the garlic, onion, celery, carrot, thyme, rosemary, black pepper, bay leaves and cook on low for a few minutes. 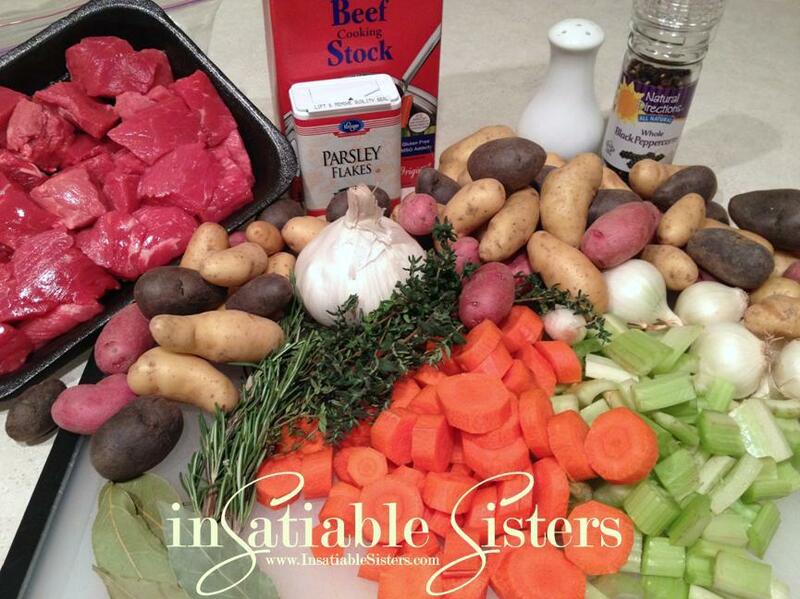 Add the beef stock, cooked beef, potatoes, wine and Worcestershire sauce. Simmer on low/med heat for 2-3 hours, stirring occasionally. If stew isn’t as thick as you like, make a thickener by whisking 1/2 cup of cold water with 2 Tbs flour, pour into soup and stir. Ladle into bowls, serve with crusty bread slathered with homemade butter and enjoy! A foody friend of mine gave me this recipe for a balsamic cream sauce and it sounded so delicious and simple that I tried it that very night with a roasted chicken breast. I was not disappointed. In fact, that rich, creamy sauce immediately landed among my favorite recipes, not only because it is delicious, but also because the ingredients are ones that I generally have on hand, and preparation is incredibly simple. And, although I have this paired with chicken, I think it would go incredibly well with any cut of steak or a pasta dish. Preheat oven to 375 degrees. Rinse the chicken breasts and pat dry. Gently loosen the skin to create a pocket, but don’t pull it off. Cut the butter into 8 chunks and slip it under the chicken skin, 4 chunks for each breast. Season the skin of the chicken well with salt and pepper and any additional herbs you prefer. Place breasts in an oven-safe dish and drizzle with olive oil. Roast the chicken for about 40 minutes, or until the internal temperature reaches a safe 165 degrees. While the chicken is roasting, heat the olive oil and butter in a saucepan over medium-low heat. Stir in the minced onion and cook until it has caramelized, about 15 minutes. Stir in the balsamic vinegar and cook for 1 minute, then stir in the bouillon and cream. Bring to a simmer, then remove from heat and stir in the parmesan cheese until melted. Note: I used fresh parmesan in this picture, which tasted great but left the sauce a little chunky. For a smoother sauce, use the pre-grated parm in a can, the stuff you sprinkle over spaghetti. When the chicken is done roasting, allow it to rest for about 10 minutes. Serve it whole or slice it up, but either way, be sure to serve with a generous portion of the balsamic cream. I LOVE this combination with Oven Roasted Potatoes. Enjoy! 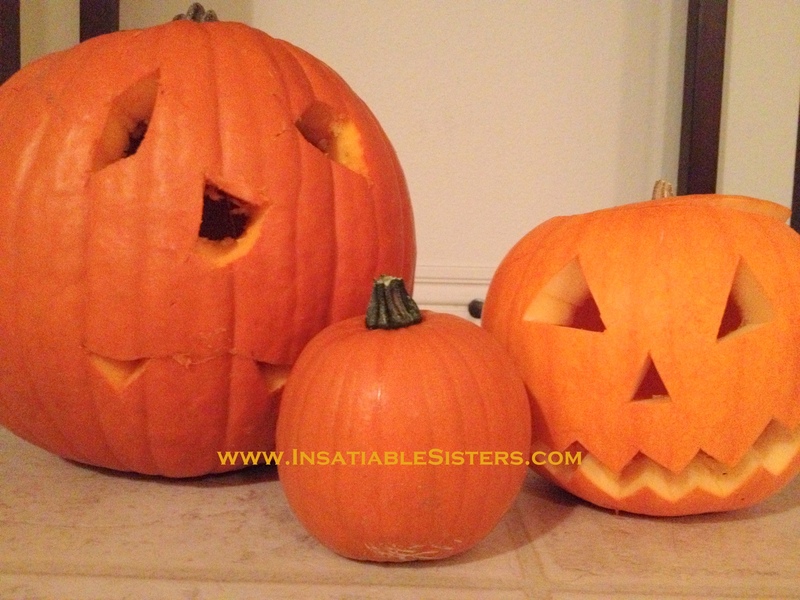 You’ve carved your pumpkin, now don’t throw out those seeds! Pumpkin seeds are a great, healthy snack as they’re full of zinc, vitamin E, and healthy fats. They are simply delicious with just a little salt, or you can get creative and try some different herbs and spices. Preheat oven on to 300 degrees. Remove the seeds from the flesh and wash thoroughly. Lay them out on a clean towel and pat dry. They will stick to your towel…this is okay. Spread seeds out evenly on a lightly greased (or sprayed) baking sheet and roast them plain for 30 minutes. 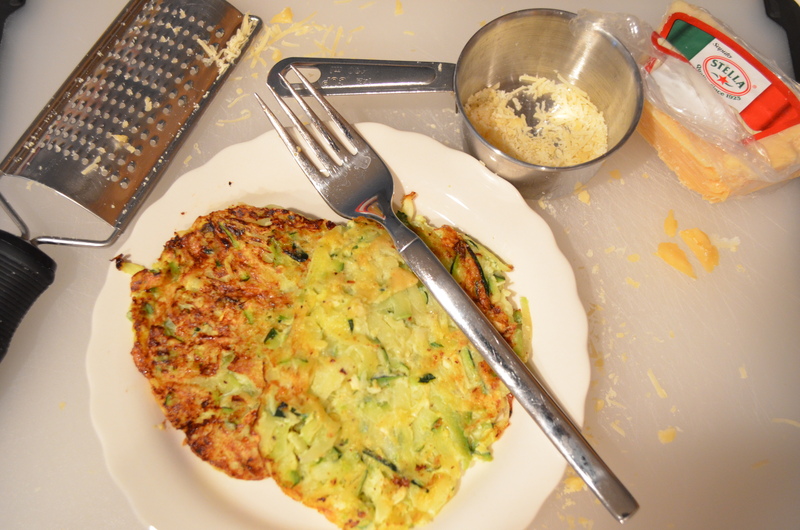 In a large mixing bowl combine shredded zucchini, eggs, parmesan, garlic powder, salt and pepper, mix to combine. Heat an electric skillet to 325 degrees and spray with cooking spray. Using your hands measure out about 1/2 cup of the mixture and press it into a patty squeezing some of the liquid out. 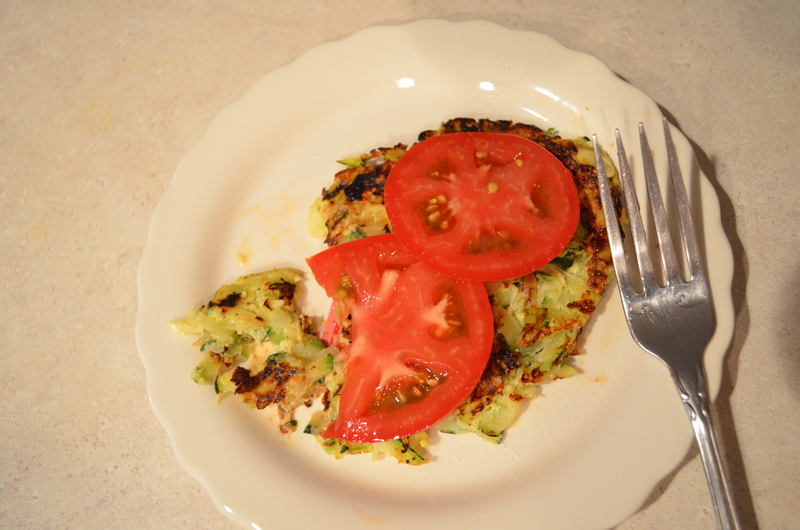 Cook on skillet until golden brown, flip to brown other side (about 4-5 minutes on each side). Be careful flipping because these are delicate and will break apart if your not careful. After they are cooked sprinkle with a little more parmesan cheese if desired. Makes approx. 6 latkas. Enjoy!! I didn’t really have much appreciation for homemade chicken noodle soup, until my niece, Lindsie, asked me to make it for her wedding. I don’t know what changed, but ever since then it has been one of my favorite soups to make, maybe because it reminds me of her and that special day. Now, there’s nothing more comforting to me than a big, steaming bowl, freshly made from (mostly) scratch. In a large stock pot, add broth and herbs. Let herbs simmer on med heat for about 20 minutes or until they’re limp and have given up their flavor. Fish out the herbs and discard. Add onion and garlic and salt. 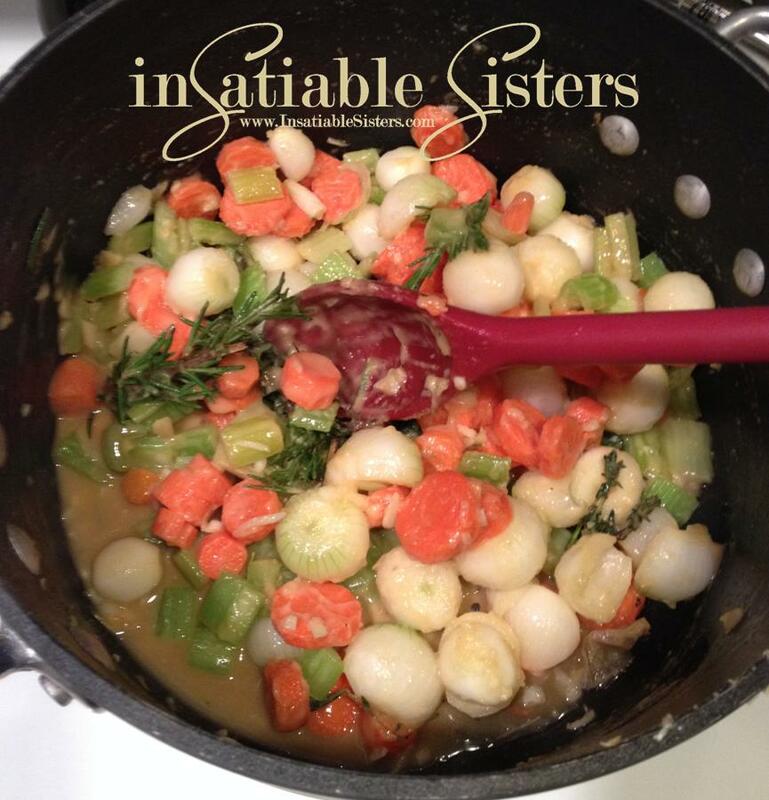 Let simmer while you chop carrots and celery. Add remaining vegetables and turn heat to low. In a separate pot, cook egg noodles using package directions, until texture is al dente (slightly firm). Add cooked noodles to the soup. If needed, add salt/pepper to taste and garnish with chopped green onions. Serve immediately and enjoy. **This soup freezes really well and is perfect for lunch on the go! My family LOVES salmon so I’m always trying to find different and intriguing ways to prepare it. 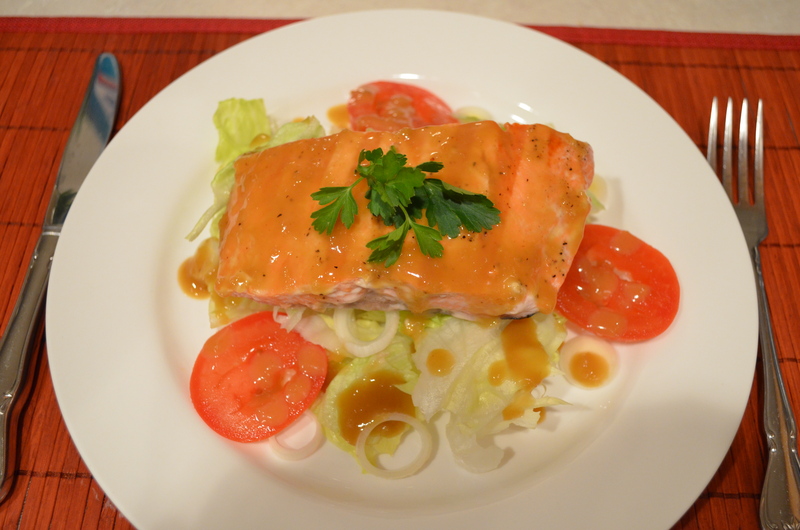 This recipe is a take on my Brown Sugar Glazed Salmon, but since I was out of brown sugar I used real maple syrup and the outcome was amazing! Combine all ingredients, except salmon, into a small saucepan and whisk. Bring to a low boil, stirring constantly so the bottom doesn’t scorch. Turn down and keep warm. 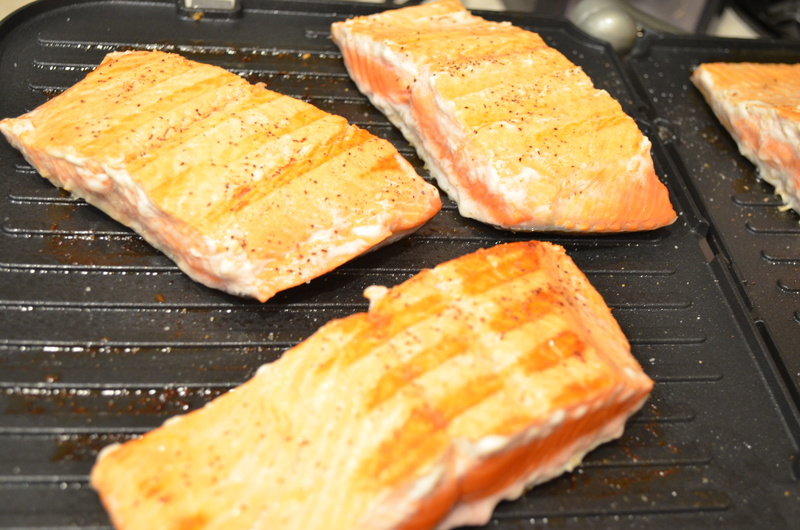 After cutting salmon into desired portions, pre-heat an electric grill (George Foreman type) and spray with non-stick cooking spray. You can also use an outdoor grill, if desired. Rub each salmon portion with a little olive oil and sprinkle with salt and pepper. Grill salmon about 7 minutes on each side. Once you put salmon on grill, refrain from moving it around! It may break up the salmon and you wont get those pretty grill marks!